Wait, no, actually – scrap that. We definitely don’t. Practically no student genuinely enjoys the exam process, which is pretty understandable. Some are better at taking exams than others, but none of it is hugely pleasant. And if you’re in the process of sitting, or are about to sit, your first uni exams (well, hopefully not literally sitting them right now), the whole thing can be even more unclear. What are the expectations? How will you perform compared with your high school exams? And so on. We remember that feeling very well, so here’s some of our advice on how to deal with the whole shebang. Try not to get consumed. Because at the end of the day, building your exams up to the nth degree won’t get you very far. Yeah, they might be important for your units – perhaps even very important! – but an exam will never be do-or-die. Or at least, we hope not, because that would be a pretty hectic exam. 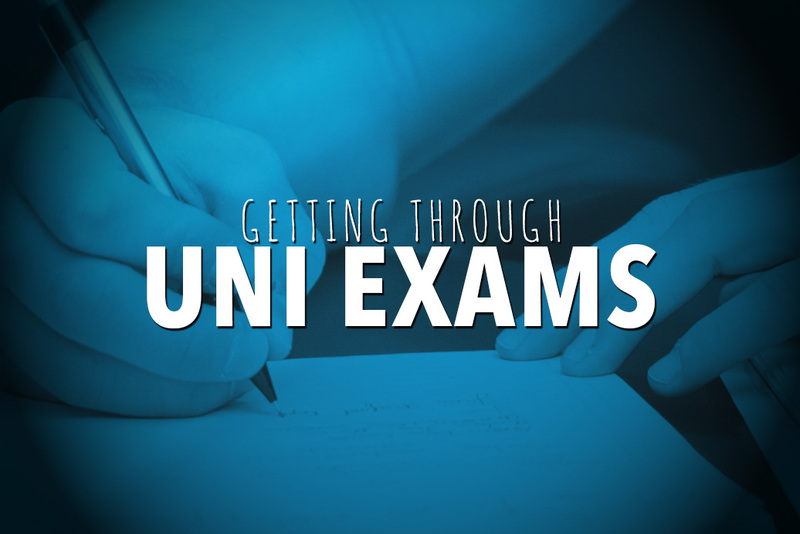 Realistically, uni exams are regularly worth 20-50% of your mark for any given unit. It might be more, it might be less – but that’s where a lot of them sit. But that’s just one unit of many. and your marks will unlikely change drastically based on any individual assessment in isolation. It’s one of those things where like, the more you think about it, the more you’ll wind yourself up. Instead, it might be worth going for an evening stroll or a coffee with friends – just to get your mind off things. You’ve definitely heard this before. And it’s definitely worth reiterating. No matter what unit, your exams aren’t worth sacrificing your health, which should always be number one. So, you need to sleep well, to eat well – all of the regular stuff. The interesting thing, though, is that doing this will probably be beneficial for your marks, too. If you stay up all night trying to cram, that’s obviously not good for your health – you need your sleep. But it’s also not going to be good for your marks. If you have a morning exam the next day, how can you expect to perform at your best when you’re sleep-deprived? Making sure you’re in good shape should certainly be a priority in general, but the benefits for your exams will also be great. Of course, this is a big part of getting through the entire exam period. A lot of people feel like they’re flying after the first couple, but then burn out toward the end, and don’t perform as well on their later exams. That’s not what you want. What you do want is consistency, and that will come if you don’t push yourself and your body too hard. Reduce stress – be prepared. It’s pretty easy for us to say, like, “the best preparation is consistent study throughout the semester!” Probably true, but also probably not much use to you right now if you’re flapping away, stressing about the fact that you somehow managed to get 38 lectures behind during semester. So let’s put that to one side. Preparation is still important, even if you’ve let things slip a bit before exams. How so? Well, the basic idea is that you want to be in the best possible position to do well on exam day. To give yourself the the best chance of hitting that ideal headspace, you should do what you can to reduce exam-day stress. For me, that meant knowing very clearly how to get to the exam venue, having my pens and pencils and stuff all ready in a zip-lock bag, making sure I had my student ID, and so on. Even if you feel entirely unprepared in terms of the subject’s content, there are still some things you can control, and even small things like these can give you confidence. You never know what’s going to happen on exam days. Traffic could be terrible, trains could be delayed (shock horror – trains delayed?! ), you could sleep through your alarm(s).